Of course, it depends on whose summer you are talking about. But in the northern hemisphere or the southern, you can work the summer season, and return to the rest of your life after that, until the next season. Tour season, of course, is impacted by the weather. Student tours begin in March, and run through June, and they often meet weather challenges. 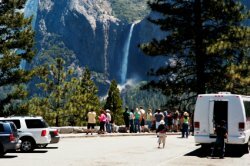 Adult tours within the US usually start in early May and run through October. May tours often encounter weather challenges, and some of the most popular sites, such as Yellowstone National Park, open and close roads daily to accommodate the latest storm or lingering snowpack. Autumn tours handle the same problem in reverse, as the snow season begins and the parks prepare for winter. The parks may be open year-round, but tours do not run year-round in areas where winter visits. Tour operators do offer shoulder (between)- and low -season tours, as does the cruise industry. The tour offerings are more limited in number, and thus so are the tour directing/guiding opportunities, but the possibilities are there. The situation is comparable in Europe. Rome is at the same latitude as New York City, so weather patterns and seasons are comparable. And the reverse happens in the southern hemisphere, where summer begins in December and ends in May. Cruise season, of course, is in the off-season for northern latitude tours, and provides a welcome respite from northern winters. Shoulder- and low-season departures are offered, as well as positioning tours where ships that conducted northern tours in the summer move south for a new tour season at a different latitude. Tour guide opportunities in the off-season involve local work helping at conventions, conferences, reunions, incentive activities. Such work is usually for a few days at a time, until the next convention comes to town. A tour guide and tour director can choose which season in which location is most desirable, and with careful planning, can move among the seasons to create a longer working season.